Prospect Books, publisher of books about cookery, food history and the ethnology of food. 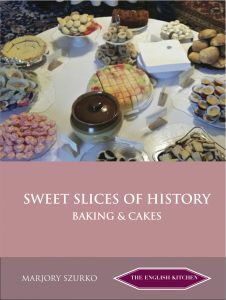 The Fortnum & Mason Food & Drink Awards 2019 were announced this week – along with Jay Rayner, Diana Henry and many others, our own Marjory Szurko is shortlisted for her book, Sweet Slices of History! Our food history magazine which comes out 3 times a year is called Petits Propos Culinaires, or PPC. PPC – new subscriptions will start with PPC 114. To subscribe, use the link above. We love book orders from this site, and I will be sending them out promptly, so please use the Current titles tab under Books/Catalogue on the menu above on this page. We use Parcel Force or couriers, or Royal Mail. Our payments are handled by Pay Pal or by Nochex which takes Visa and Master Card, all other cards except for Amex. We are hopefully fast at getting the orders out so please go ahead! If you are a trade customer, you can download this list of our titles: list2017 .